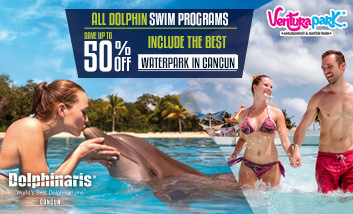 It is very important that you read the Terms and Conditions very carefully before booking your reservation in Wet’n Wild Cancun. The total amount of your reservations will be charged to your card at the moment of booking. When you pay with Visa or Master Card, the charge will apply in US dollars. Other currency’s exchange rate will be made with the current bank rate. The charge will appear on your bank statement under the name of Dolphinaris. It is necessary that the holder of the credit card with which the payment was made, is presented with a photo ID. Otherwise your booking will not be valid. All modifications or changes should be made at least 24 hours in advance of your visit’s confirmed date. Only date’s changes will be allowed. To make any modification, please send your reservation confirmation number and the new date of your visit to e-mail address: and our reservations staff will contact you. To make the refund for canceling a reservation, you must do it at least 3 days prior to the confirmed reservation date, taking a charge of 10% of the amount thereof. If you want to reschedule your visit just call us 24 hours in advance and will reschedule his visit. And if it does not fit your vacation plan until your reservation is valid for one year from the date of purchase. In case of no show the charged amount is not refundable. 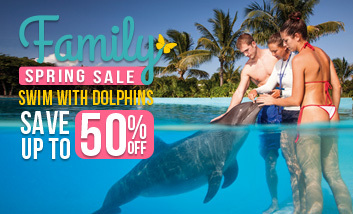 Dolphinaris does everything possible for our visitors with special needs are comfortable. However, you must contact our reservations staff before making your purchase, to explain the type of assistance required and ensure that these needs can be met.